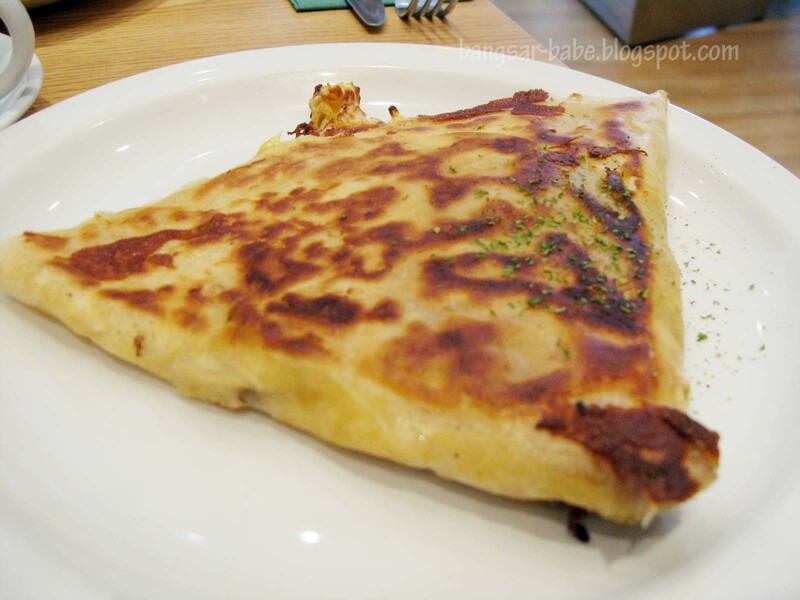 There were many things I wanted to eat in London, so I made a list. 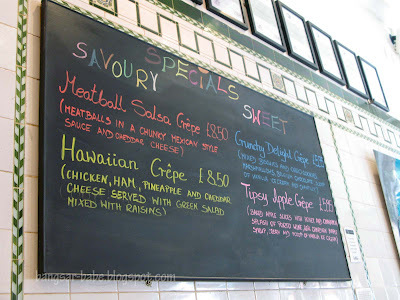 On top of my list was Cafe Crêperie at South Kensington. Kinga, my flatmate in uni came to London to meet me, and I eagerly suggested crêpes for lunch. 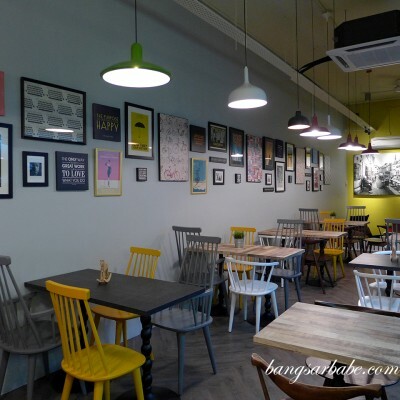 This little cafe is just a stone’s throw from the South Kensington tube station, and a walking distance from Harrods or The Victoria & Albert Museum. 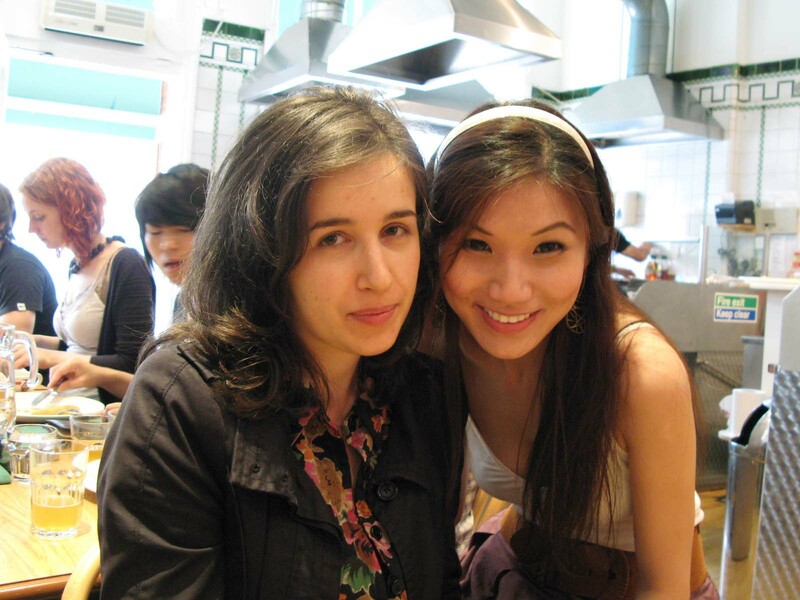 The restaurant is so small and often packed with people, that you tend to bang elbows with your neighbours. Service was slightly hasty that day – the restaurant was very crowded. Not a good place to go to if you want a quiet lunch. It gets pretty chaotic during peak hours, especially when there’s a long queue outside. 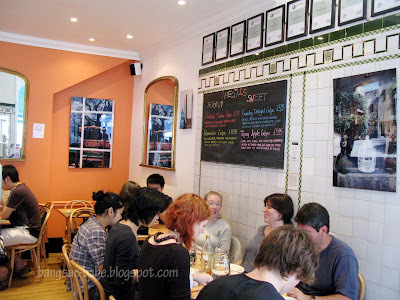 I tried this during my visit to London in 2007 – rif’s sister took us there for brunch. 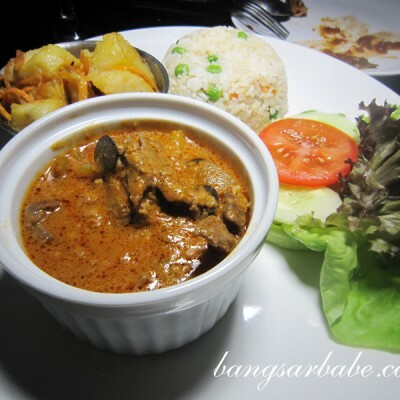 Back then, this blog did not exist so I didn’t take pictures of my food. This time around, I made sure I did. They don’t stinge on ingredients! This place makes really good crêpes, both savoury and sweet. 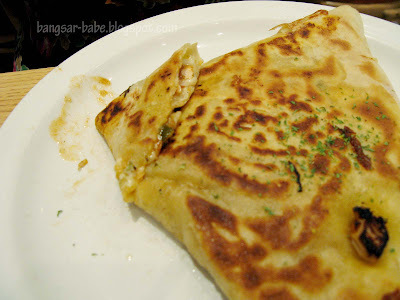 They use two types of flour — white Froment flour or the dark nutty-flavoured Sarazzin flour (100% Buckwheat). 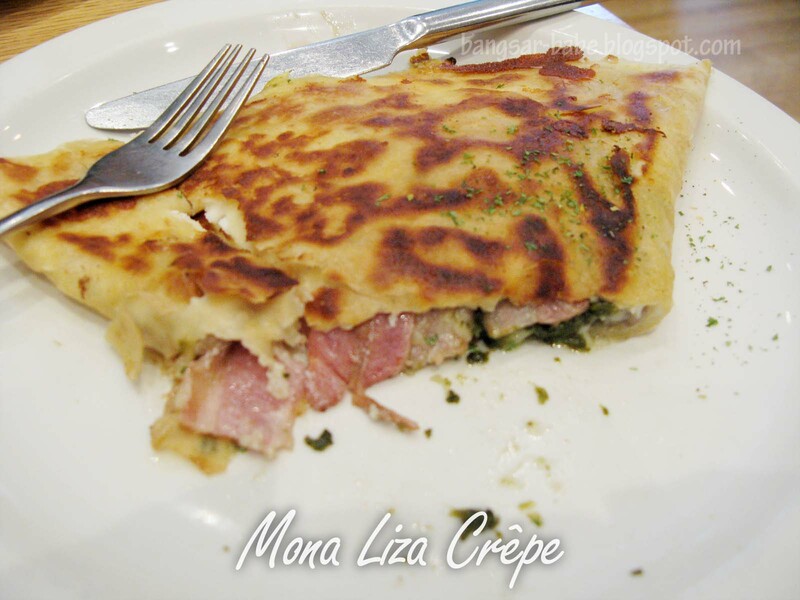 The crêpes are thin and crispy on the outside, and bursting with ingredients on the inside. My Mona Liza (£7.75) comprised feta cheese, spinach, mushroom, crispy bacon, egg (soft or hard) and cheddar cheese. I asked for soft egg in my crêpe. It was incredibly satisfying. The addition of spinach gave the filling a bit of texture and helped balance the richness of the cheese. 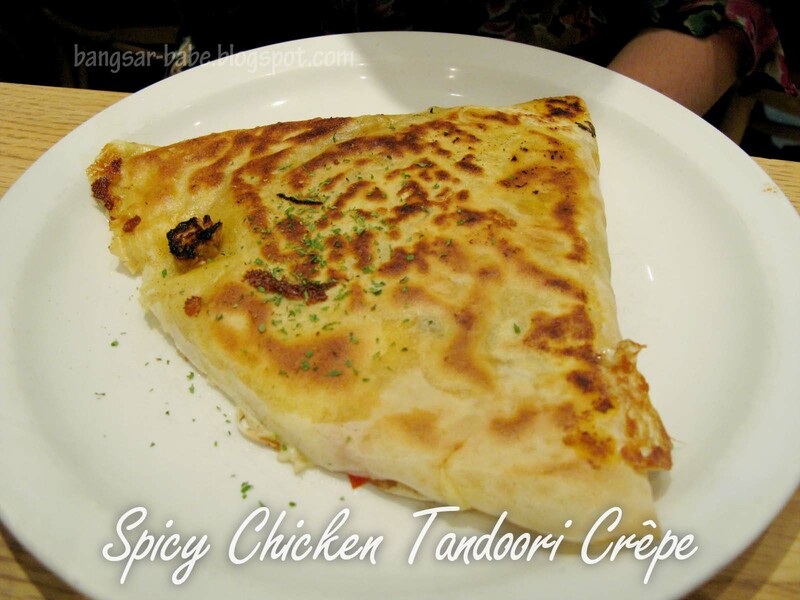 Kinga went for the Spicy Chicken Tandoori Crêpe (£7.75). I had a bite, and found it to be pretty interesting. I never knew tandoori would go well with cheese and ratatouille (stewed vegetables). 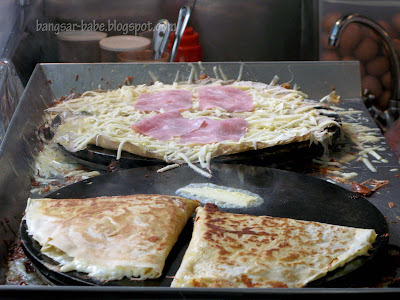 Despite the word “spicy”, this crêpe was hardly spicy. My brother who tagged along for lunch had the New York Special (£7.75), which was crêpe with crispy bacon, brie, egg (soft or hard) and cheddar cheese. I liked this, but it might be a tad cloying for those who prefer their food lightly flavoured. 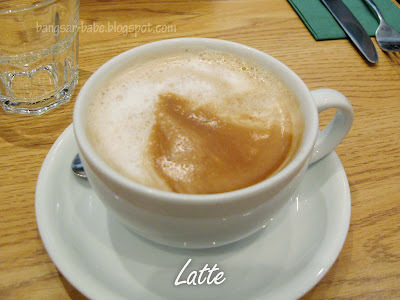 My latte (£2 – large) was good – then again, coffees in UK are generally good. I reckon it’s the milk they use. Good stuff! You have to try this when you’re in London! 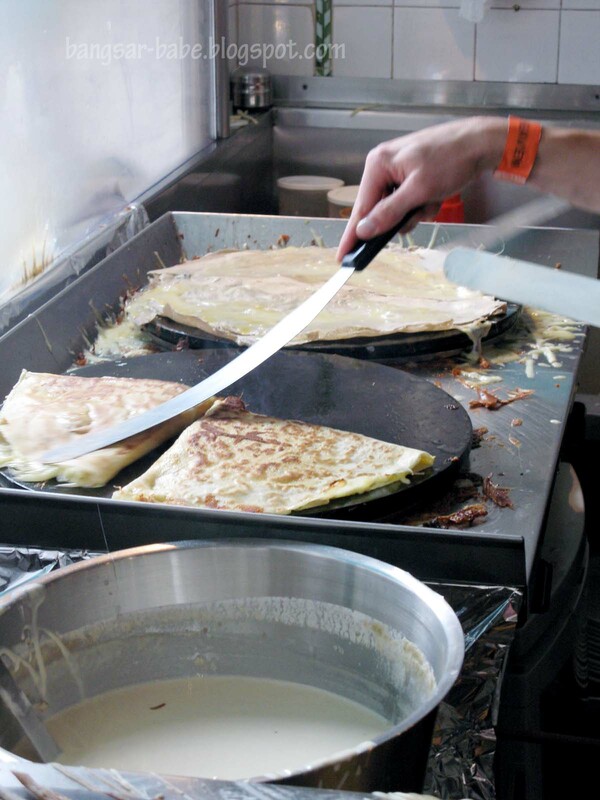 Verdict: Tres tres yummy crêpes. Go there early, as the place gets packed very quickly. Same same as the one in Hamstead, on the "cart" aka road-side? Back from London, back to reality eh … funny how we were both in the UK at the same time, but I was roughing it out in the countryside!! 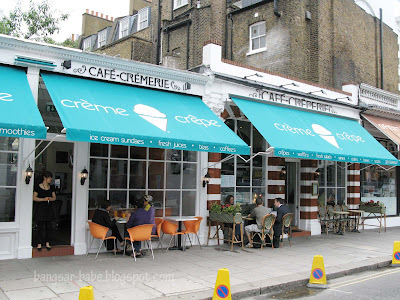 Whenever I am in London during the weekend, Cafe Crêperie is one of the place that frequently visit and there is another place in South Hampstead – La Creperie de Hampstead is worth taking a train ride to get there for a crepe. TY – Thanks for the recommendation. 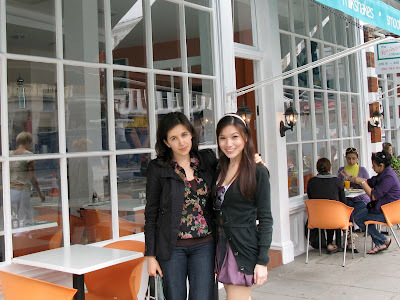 I'll definitely keep that in mind if I visit London again. Fingers crossed, it won't be long. Kenshin Asuka – Good to know!